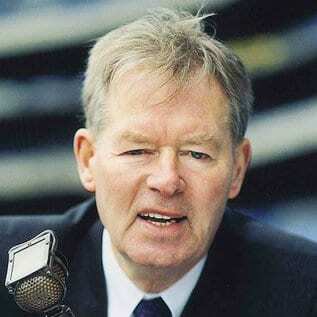 Micheál Ó Muircheartaigh, Ireland’s best-known Gaelic Games commentator, was born in 1930 in Dún Síon, near Dingle, Co. Kerry. This much loved former teacher, broadcaster, author and raconteur first came to prominence in 1949 with his first broadcast after being selected for the job following a test commentary on a hurling game. He has since has been the public voice of the GAA with his uniquely entertaining and often bilingual commentaries. A native Irish speaker, Micheál Ó Muircheartaigh has always shown a keen interest in the promotion and development of the Irish language. One of his charms has always been the ease in which he moved from one language into the other during his commentaries. Micheál is known for his life-long interest in greyhound racing and has regularly commentated on the sport on both radio and television. He has also participated in a building project for the Niall Mellon Township Trust in South Africa. Micheál has published two best-selling books, From Dun Síon to Croke Park and From Borroloola to Mangerton Mountain. In August 2010, Micheál Ó Muircheartaigh announced his retirement from the commentary box with the Cork v Down All Ireland final as one of his last games. Micheál is a popular after-dinner speaker, MC and awards host for events in the sport and business circuits. Whether he is reminiscing, explaining or addressing his audience, his humour, passion and love for sport always shines through. He has been described as the consummate storyteller and a true professional.